Rex Goodwin is anything but what his last name suggests. He is the Director of Public Maintainence for New Domino City, a well-spoken and highly educated politician who operates and negotiates under a calm and patient face that masks a sinister personality that thrives on the power he possess and hopes to possess. Mr. Goodwin was the driving force behind the creation of the Secretarian State that now exists in New Domino City. Mr. Goodwin not only knows the about the secret of the Crimon Dragon, but looks to use its power to lead New Domino City into a bright and prosperous future. According to Goodwin himself, he is the leader of an Illuminati-type of organization known as “Yliaster.” During his tenure as the Chief of Public Maintenance for Domino City, Domino has been transformed into a futuristic “utopia,” run by a hierarchical system with Goodwin at its head. He employs Trudge and other security officers as enforcers, and shows interest in the dragon birthmarks that both Yusei Fudo and Jack Atlas have. Jack is Goodwin’s protege and the lone success story in moving up New Domino City’s class system. Goodwin considers all other residents of Satellite – and indeed all poor, whom he believes cultivate evil – “scum”, but masquerades his beliefs of classism and plutocracy with utilitarianism, saying that everyone must work together to maintain the delicate balance between the Satellite Sector and Neo Domino City. It is revealed in episode 37 that even though the people in New Domino say that Goodwin was the one to separate New Domino City and the Satellite, it is not true as Goodwin was still in the Satellite at the time New Domino City and the Satellite were separated, meaning to say Goodwin was not born in New Domino City, but in the Satellite. The Arcadia Movement has used such information to blackmail him so it can conduct itself with impunity. In episode 62, it is also revealed that he was the Legendary D-Wheeler who attempted to cross Daedalus Bridge, but lost his left arm in the process, replacing it with a bionic arm that also acts as a duel disk. Rex worked with Professor Fudo, alongside his brother, Roman, on the Enerdy project. One day however, Roman, who became aligned with the Dark Signers, betrayed them and caused a massive explosion that separated the Satellite from New Domino City. 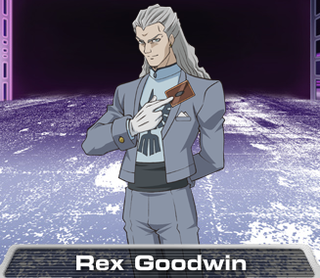 Before the explosion, Rex was entrusted with both three dragon cards given to him by Professor Fudo, and Roman’s arm, containing the Signer birthmark of the dragon’s head. He kept the arm stored away in a shrine, whilst he put the three dragon cards into circulation, where they eventually reached their owners, Yusei, Jack and Akiza. He has since become head of Public Safety Maintenance Bureau, and has kept New Domino City and the Satellite separate from each other in order to protect it from the Dark Signers. Rex needs all five birthmarks in order to summon up the Crimson Dragon, whose advent he claims will bring peace to the world. Others, however, including Jack and Bolt Tanner, have expressed suspicion that Goodwin’s intentions are far less pure than he claims. After witnessing the appearance of the Crimson Dragon during Yusei’s and Jack’s Riding Duel, he reveals his status to Jack as the 360th Star Guardian and informs Jack that he is a prophetical savior called a “Signer”. However, Goodwin conceals the whole truth from Jack; the exact reason for doing so is unknown, but Goodwin believes the truth would spark Jack’s fire. Goodwin later arranges the Fortune Cup, in hopes of finding Signers by inviting participants randomly and inserting his own dueling assassins who will expose a Signer upon dueling one. Goodwin is shown to have control, either directly or through Zigzix and Lazar, of nearly every aspect of the tournament. 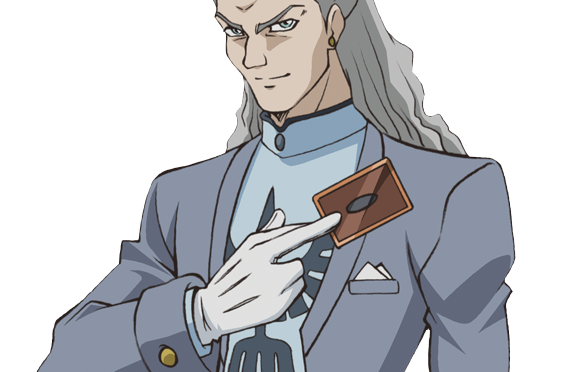 He also has a large string of backup plans should things not go his way: for example, upon discovering that Leo had substituted for his Signer sister in the tournament, he arranges a “consolation duel” to expose Luna. In one of his many experiments to unleash the Crimson Dragon, Goodwin demolished a poor village in Southwestern America. Greiger, who was from that village had been promised reconstruction aid to his hometown depending on how he performed in the Fortune Cup. Greiger somehow finds out what Goodwin did to the village and after Greiger loses to Yusei, he attacks Goodwin, resulting in a spike from Greiger’s Duel Runner flying off and Goodwin catching it, revealing himself to have a mechanical arm. During the duel of Jack and Yusei, Goodwin revealed to possess a severed arm with the final dragon birthmark on it. Rex Goodwin speaks to Yusei at a bridge and tells him that if he wants to save the Satellite then Yusei must join forces with the other four Signers. However when he claims that they’re missing one, Rex tells him that it would eventually appear, since it’s destined to join them in this battle as well. Since then, Goodwin has been sitting in his office observing the incidents involving the Dark Signers, and is somewhat disturbed when two of the Dark Signers, Carly and Misty awaken their powers at once in the middle of New Domino City. Once the Signers; Yusei, Jack, Akiza and Luna, are united, Rex informs them about the Crimson Dragon and the Dark Signers. Before they go off to investigate the Satellite, he promises to Yusei that once everything is done, he’d finish construction of the Daedalus Bridge. During a duel between Roman and Yusei, Roman reveals that he is in fact Rex’s older brother. Rex goes over to confront Roman, and they challenge each other to a duel in order to fulfill a promise, with Rex’s hand acting as a personal duel disk. Throwing the duel and becoming a Dark Signer as a result, hiding this fact at the time, Rex then goes on to explain to Crow what had happened during Zero Reverse. After Akiza defeats Misty, a Condor geoglyph shines in the sky and the King of the Underworld is released. The Crimson Dragon warps Yusei and friends in front of a temple, where they find Goodwin as he reveals himself to be a Dark Signer and integrated Roman’s Signer arm onto himself, gaining the power of a Signer to augment his Dark Signer powers. He challenges Yusei, Jack and Crow to a 3 against 1 Turbo Duel, using both Synchro and Dark Synchro monsters. He claims that his plan is to end the continual cycle of the battle between the Signers by using the power of the Earthbound Immortals to destroy the world then recreate it to his design through the Crimson Dragon, with himself as a god. He then steals the power of all the birthmarks and absorbs them into his body, citing himself as a god. However, Yusei manages to regain the birthmark powers from him and defeat him and the King of the Underworld. He and Roman decide to pass onto the afterlife whilst the other Dark Signers are revived. In his duel against Yusei, Jack and Crow, Rex’s deck reflects that of his fused state, utilising both Synchro and Dark Synchro monsters, representing the sun and the moon. His Sun Dragon Inti punishes players that manage to destroy it while his Moon Shadow Dragon Quilla is able to resummon it from the grave. His other monsters appear to be based on tribes. His Earthbound Immortal is Wiraqocha Rasca, based on the Condor Nazca Line.